Do you need a Power Bank? 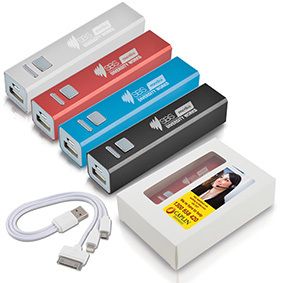 Custom printed power banks are becoming increasingly popular, particularly in the corporate world. Smartphones, tablets, laptops and other tech devices have become critical to the way we do business. But what if your laptop ran out of power whilst you were on the road? On the way to a remote meeting perhaps? Keeping your devices charged and at the ready isn't just necessary, it's essential for completing day-to-day tasks. How do power banks work? A portable power bank is an external battery source in a sealed case. It has been specifically designed to control the flow of power. A USB cable enables you to attach it to your computer or laptop (or any USB port) when it requires charging, then attach it to your phone or tablet when it is running low on power to recharge. Although different power banks have different mAh (milli-ampere hour) which measures how much energy the power bank can store so be sure to check what you require the power bank to charge to determine how many mAh you will require to suit your needs. Most power banks can be charged up to 300 times. With a range of colours and decoration options, power banks can be suitably branded to your corporate colours.